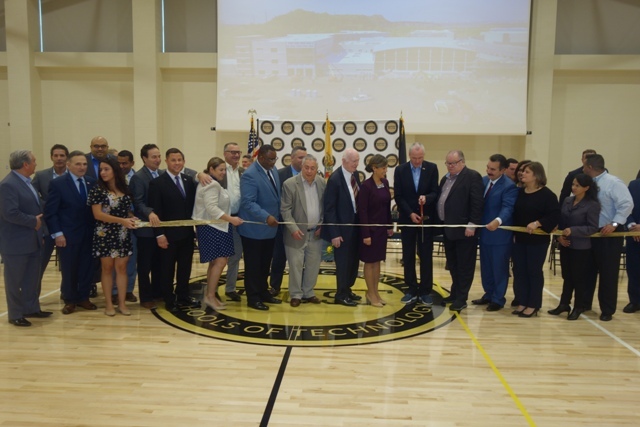 A BIG EVENT – Officials from throughout Hudson County gathered to help cut the ribbon on the new county High Tech High School in Secaucus. Frank Gargiulo, superintendent of Hudson County Schools of Technology — the group of countywide public schools in Hudson County — walked for the first time through the front doors of the new High Tech High School campus in Secaucus last month. The new complex was named for Gargiulo, who looked a little embarrassed standing in front of the foot-high letters, emblazoned with his name. The new high school opened its doors this fall after moving its campus from North Bergen. Officials from throughout the state and county had gathered to hold an official grand opening ceremony to celebrate both the new building and the man it was named for. A host of Democrats came to pay tribute to Gargiulo, some joking about his being a registered Republican. Among the dignitaries were Gov. Phil Murphy and New Jersey Education Commissioner Dr. Lamont Repollet. The Frank J. Gargiulo Campus is a $160 million project that received more than half of its funding from the New Jersey Department of Education. The new facility is home to High Tech High School, KAS Prep, and Hudson Technical, and features three levels of classrooms, an underground parking garage, a 340-seat theater, a gymnasium; it also houses the district’s administrative offices. The complex is adjacent to Laurel Hill Park, near the Secaucus Junction NJ Transit station. The school has been constructed on a 22-acre site owned by the county, roughly twice the size of the old High Tech building in North Bergen. It has wings dedicated to vocational academies focused on culinary arts, design and fabrication, performing arts, technical and visual arts, and science tech. A fabrication lab helps students explore spatial ideas through model building. The school also has a 120-seat black box theater, a 325-seat performing arts auditorium, 80-inch interactive monitors that replace and enhance standard chalkboard learning, and a TV production studio with a functioning control room. Outdoor amenities include a hydroponic rooftop garden where students will grow food to be used in the culinary kitchen lab. The school also serves as a satellite for Hudson County Community College. About 1,200 students are enrolled in various programs at the school. In addition to a traditional four-year high school, the new campus building also houses KAS Prep – an alternative high school program – and Hudson Technical, a post-secondary certification program. This school was designed to achieve LEED Gold certification from the U.S. Green Building Council. Features such as water-efficient landscaping, geothermal heating, green roof and wind turbines reduce the amount of greenhouse gases and wastewater emitted from the campus. 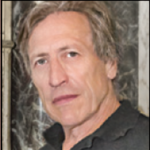 Gargulio has served in Hudson County education for about three decades both as an instructor and administrator.